So How does the Guardian Lock Work? Super easy but we have included a step-by-step photo demonstration for you. Place The Guardian Lock on the deadbolt of the door in the Locked position. Notice that the tail of the Guardian Lock is placed so that it will hit and be stopped by the handle if someone tries to unlock the deadbolt from the outside. 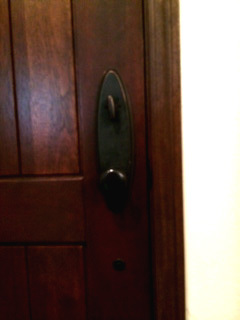 This particular dead bolt opens counter-clockwise. 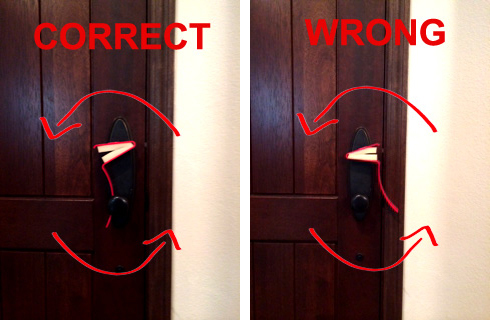 Different deadbolts spin in different directions, just make sure to place the “Guardians” tail so it prevents the deadbolt from opening fully. You can place the Guardian Lock in many different positions for effectiveness depending on each different door, making it’s almost application almost universal. Double check the placement and your done! Sleep well! 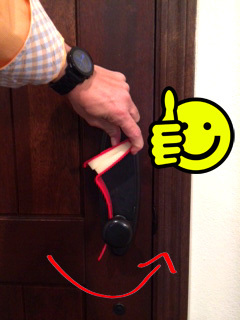 Don’t forget to play around with the Guardian Lock’s positioning on the door to get you the best locked position. Sometimes it will be placed in front of the knob, sometimes behind the knob, and sometimes I have even seen it placed upside down. The lock is slightly bendable to increase the positioning angles.